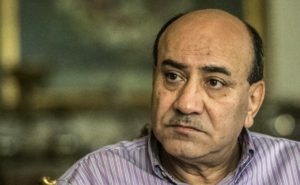 Hisham Geneina, Egypt’s former anti-corruption authority boss and campaign aide of presidential hopeful General Sami Anan has been sentenced to five years in prison for spearing fake news purporting that the former army Chief of Staff has sensitive documents that can incriminate the regime for crimes committed in the aftermath of 2011 revolution. Geneina’s lawyer Ali Taha Tuesday pointed out that they will appeal the ruling. Geneina has been referred to a military court after being arrested in February following an interview with HuffPost Arabi posted in February. In the interview, Geneina operating as Anan campaign aide told the media that the army Chief of Staff, who has been placed in detention, possesses damning documents on the political crises that Egyptian society has passed through” since the 2011, that incriminate the army. The documents were kept outside the country and would be released should Anan be harmed, Geneina had said in the interview. Anan was arrested few weeks before the March presidential polls. The army detained him for breaching military code over his candidacy. Geneina, before his arrest, had been attacked by armed men and beaten. He was fired from his position at the head of the anti-corruption authority in 2016 after he revealed that Egypt lost $67.6bn over four years due to corruption. Geneina, a vocal critic of President al-Sisi, had joined a group of political figures who called on Egyptians to boycott the presidential election. Turnout was put at little above 40 per cent despite regime’s threats and incentives to urge people to cast their votes. Written by: KanelkaTagba on April 25, 2018. Posted by KanelkaTagba on Apr 25 2018. Filed under Headlines, World News. You can follow any responses to this entry through the RSS 2.0. Both comments and pings are currently closed.